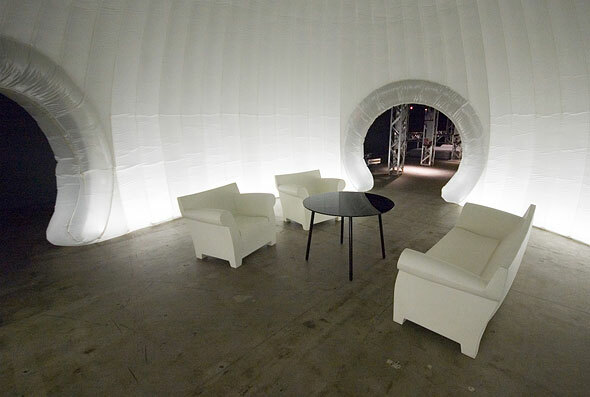 I've always been fascinated with all things space. In fact, my earliest memory was waking up in the hospital when I was three with a plastic toy space shuttle on my bed. Plus, the timing couldn't be better, because NASA had another hole-in-one shot to Mars last week and Canada's meteorological station is now reporting daily from the red planet. Things have changed in the past 20 years since I first fell in love with space. Instead of an emphasis on satellite telescopes and international space stations, Mars is becoming a regular (albeit permanent) parking spot (and sometimes graveyard) for our world's space stuff. 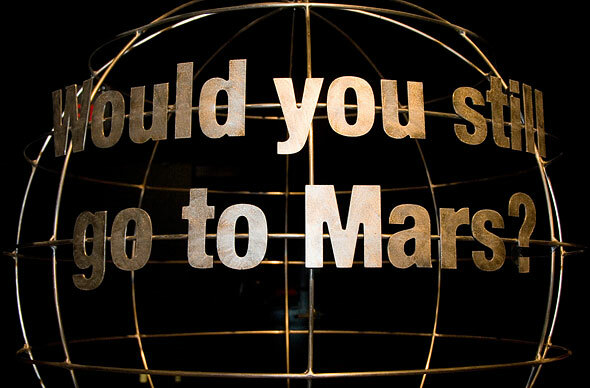 interactive experiences to engage participants in the real physical, psychological and scientific challenges involved in journeying to Mars." 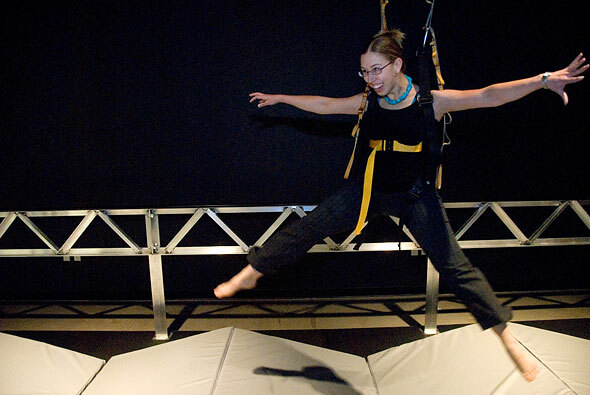 Visitors will experience the feeling of reduced gravity as they try to move about at 1/3 of their body's normal weight. 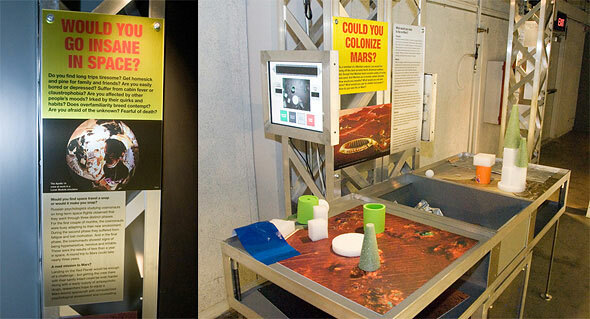 The exhibit is composed of 30 interactive exhibits, each exploring a particular challenge of a mission to Mars. Naturally the target audience is kids - after all, the first astronauts to leave for Mars are likely in elementary school now. Some of the many questions explored. The exhibit opens next Monday, June 9th and will run until January 4th, 2009. 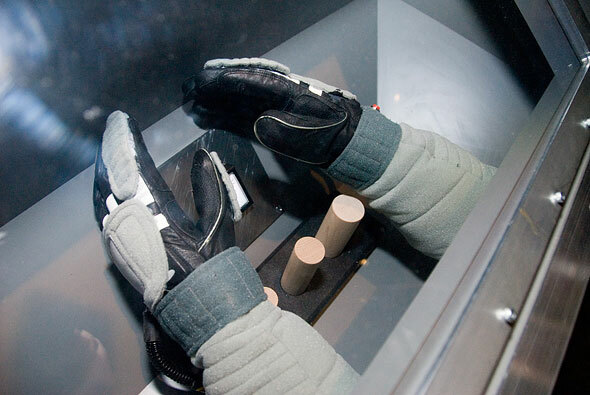 One of many interactive exhibits, using space gloves under simulated low pressure. 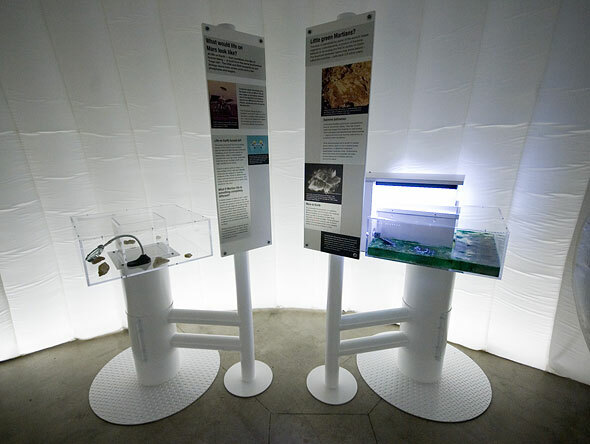 The exhibit is complemented by daily screenings of Roving Mars at the Science Centre's OMNIMAX theatre (photo at top of post) documenting the construction, journey and mission of the overwhelmingly successful Mars rovers Spirit and Opportunity. The first third of the film is rather weak, but the film really takes off once the mission is off the ground. The film is a little dated, but the images from Mars are spectacular on the big screen and has a lot more "wow" than the exhibit. The movie naturally costs more but can be packaged with the exhibit at a discount.